Image of the first X-ray laser beam in the tunnel from the European XFEL&apos;s SASE3 undulator. 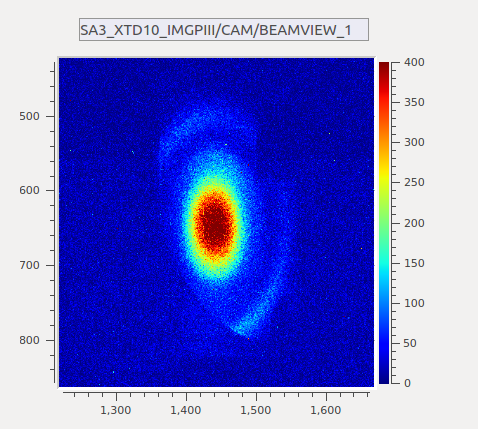 SASE3 generates X-rays with a wavelength similar to the width of an atom. Those X-rays will be used to study subjects such as the formation and breaking of chemical bonds and the emergence of special properties such as semiconductivity in materials. The new X-ray light source SASE3 uses electrons that have first passed through the light source SASE1 where they have already produced laser light. SASE3 provides laser light that will provide X-ray light for the experiment stations SQS and SCS, which are currently under construction. The SQS instrument (Small Quantum Systems) is specialized for the study of fundamental processes such as how chemical bonds break in molecules, or what happens on the atomic level when materials absorb many photons at the same time. The SCS instrument (Spectroscopy and Coherent Scattering) will focus on the investigation of fast changes in material properties, such as within magnetic materials, materials that withstand extreme temperatures, superconducting materials, and also biological samples. The research at these two stations has relevance for basic research but also for the development of new materials in the fields of IT, medicine, energy research, and catalysts, among others.